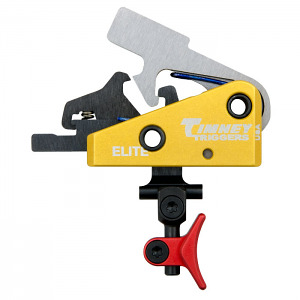 Timney's Calvin Elite drop in replacement trigger for the AR15. Featuring a 5-pound hammer spring coupled with a crisp and zero creep 1.5-pound pull and a sharp, tactile reset allows for quick and precise follow up shots, ideal for the 3 gun competition shooter. Comes with four different trigger shoes (all red): curved, flat, heeled, and knurled, each adjustable for length of pull, cast and height. Excellent Trigger. Installed on my Sig Sauer MCX which is not an AR. I had to unscrew the trigger piece for it to fit under my safety but it works beautifully. A+ would recommend. Much better than any Geissele I've shot with.